1.) Get yourself some shrimp! 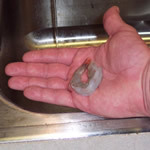 Shrimp Butler can peel shrimp from very small (41/50 ct.) to extra large (21/25 ct.). 2.) 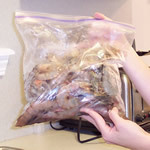 Thaw and take heads off shrimp. 3.) Get your Shrimp Butler. 4.) 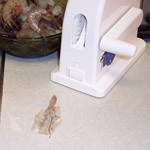 Place shrimp in Shrimp Butler with tail facing the rear as shown. 5.) 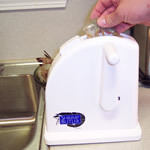 Pull Shrimp Butler lever quickly. Shrimp Butler will shoot the shrimp out the front. 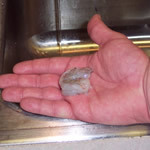 Shrimp is peeled, butterflied, and deveined. 6.) 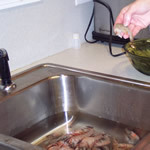 Rinse shrimp under faucet and leave tail on for cocktail shrimp. 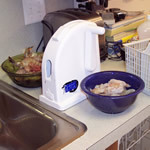 Remove tail for gumbo, poboys, or other dishes. 7.) Another fine job by the Shrimp Butler! 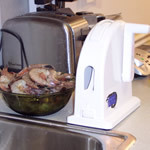 Shrimp Butler Replacement blade only. Shrimp Butler Sizzlin Grill Spice only.